Lorena Oberg is widely accepted as the WORLD Eyebrow Tattoo Removal Expert and is credited with the pioneering the techniques now accepted as best practice in the industry. 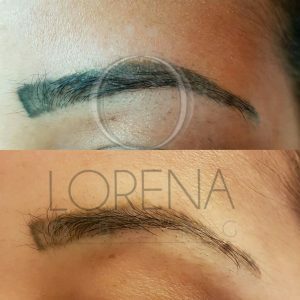 Lorena begun her career as a Permanent Makeup Artist and she therefore understands the differences between body tattoo and permanent makeup pigments, and more importantly, how to remove them. Both Lorena and Vicki have been performing Eyebrow Tattoo Removal for years and unlike other clinics, this is an area we specialise in, with thousands of treatments performed to date. We perform this treatment daily and no one has more experience in this area. Lorena lectures at Permanent Makeup Conference all over the world and teaches her techniques to doctors and technicians internationally. Lorena works on her own specialised lasers which she has made to her specifications. She also teaches on these lasers are arguably the best removal techs are trained and supported by her. We are experienced in removing all pigment colours regardless of their composition. Although there are differences between pigments, our techniques allow us to remove all colours. Some are more difficult to remove such as white and skin coloured camouflage pigment but they can all be removed. No one can guarantee removal without a scar (if they do they’re not informing you correctly), but our experience allows us to have a very low scaring rate, if any. This is evidenced in our photos. We have been able to remove a large amount of our brows leaving the client with pre tattoo condition skin and even when we have had a scar, it has been barely noticeable. You can see more before and after photos here. If you have Tattoo Eyebrows that you wish to remove, it’s best to book a consultation so that we can run you through your options.